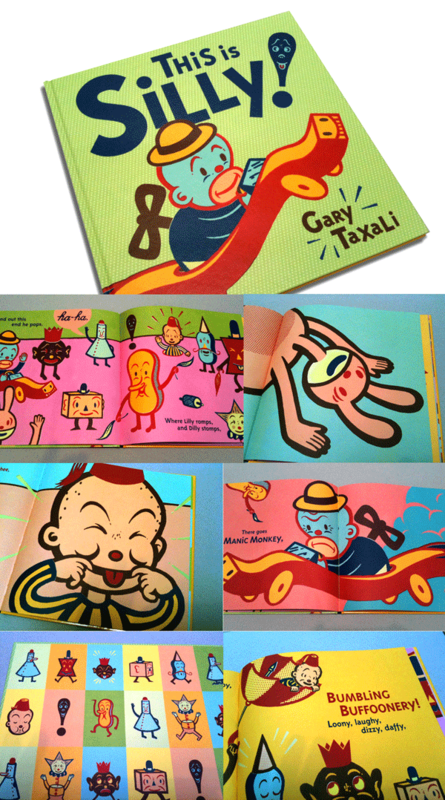 It’s evident that Gary Taxali’s first book comes from a personal place. He recounts that he had a “slew of teachers growing up, on in particular, that would tell him to ‘stop being silly’.” On the contrary, his mom always encouraged his urge to draw zany pictures and laugh. This is Silly sets out to follow his mother’s insistence. It is an incredible visual playground filled with bold, graphic illustrations of 30’s style characters like Silly Willy, Silly Sol, Lilly, Dilly, Billy and Manic Monkey. This is Gary’s world—a candy store of color, patterns and ambassadors of fun. Pink, magenta, lemon yellow, turquoise, mint green and rich crimson flood the pages and shout “loosen up, we’re partying here!” Mischief, mayhem and catastrophe befall the silly characters described in his text as “bumbling buffoonery and tumbling tomfoolery.” This is the kind of inspiration kids—and their parents—to cultivate the creative mind. Bravo to Gary for ‘paying forward’ his own childhood inspiration. Gary tells me that the drawings were easy for him but the words were challenging. Some of the silk-screened illustrations used 17 colors and 11 screens. No evidence of technology here! I asked him what was most satisfying and he said, “getting the response from children who like it. If I inspire one kid to act silly, well you know the rest.” You inspired one adult that I know. Nice, love the retro feel. It reminds me a bit of Bob Staake style. Just a tad. The color is this book is especially juicy, love it!